I bought myself a Dutch Oven for my birthday and it's honestly the best thing I've ever done. It was on sale at an outlet mall in New Orleans and I truly believe the sale was a gift presented to me by the universe. Also can't stop baking bread in it. Like I literally can't stop myself. I made 4 loaves of bread in one week and I've got another in the oven right now. I've been using this recipe, but have been experimenting with different flour combinations & toppings. I'll post some of my favorite adaptations soon. My friend John from Boda Marketing came over the other day to take some new photos for the blog, I'm really excited to have updated portraits on here as well my other social media platforms! I finally got Adobe Lightroom and have been slowly teaching myself how to use it, I love the way I can manipulate my photos now. I've still got so much more to learn but I feel like it's upped my editing skills tenfold already. Another thing I did with my time off? Combine two of the greatest things to ever exist to make the single greatest thing to ever exist. 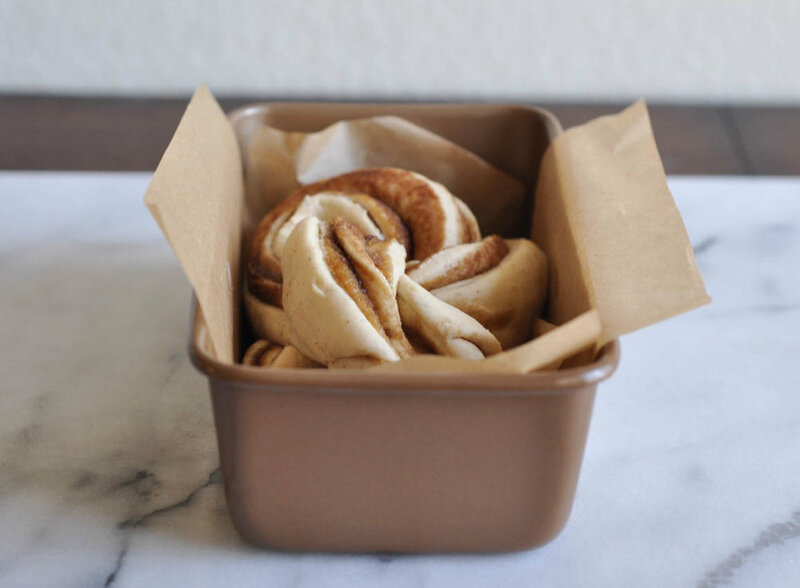 Cinnamon rolls and babka joined forces to take your breakfast game up to level 100. It's everything I've ever wanted in a baked good. Lightly sweet, with a tangy dough that puffs up into a beautiful loaf once baked. Swirls of brown sugar and cinnamon make their way throughout, and taste just as delicious as they look. I'm not the first person to ever bake cinnamon into babka, but I'm proud of the recipe that I've come up with and I know it will be the perfect addition to your holiday breakfast schedule. Babka is one of those desserts that's amazingly versatile. It pairs well with coffee in the morning, as a mid-day snack, and as a way to finish off a hearty meal. I bet it would even taste good toasted. Wait a minute.. did I just invent something? 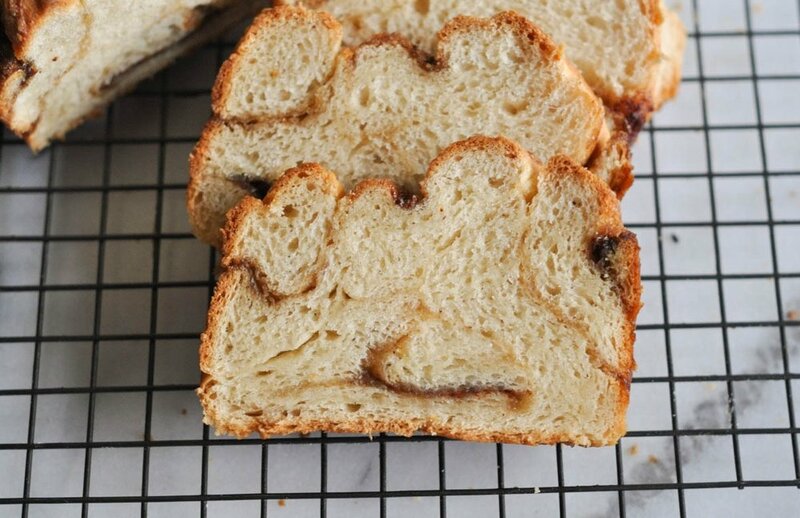 Babka toast? I hope you've enjoyed this somewhat scattered post. I like lightening up a little bit. What do you think? While the milk mixture activates, combine the flour, sugar, salt, vanilla, nutmeg and cinnamon in a stand mixer fitted with the dough hook. Slowly add in the milk mixture and aquafaba until a soft dough forms, adding extra flour if necessary. 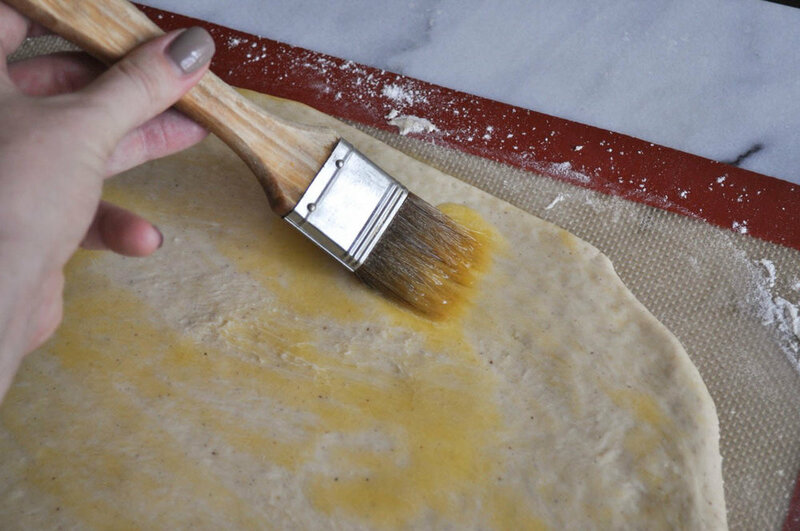 Remove the dough from the fridge and once it's warmed up enough to work with, divide the dough in half. Then a floured surface, roll each half into a large rectangle. Spread half of the melted vegan butter onto the rectangle, then sprinkle with brown sugar and cinnamon. Roll it up tightly. Wrap with plastic wrap and place in the freezer for about 10 minutes. Repeat with the other half of the dough and filling. Remove the rolls from the freezer, and slice in half lengthwise. Rotate each piece to expose the filling and then cross one piece over the other to form an "x". Cross the top and bottom piece to form a helix shape, and then fold the entire thing in half. Place into a prepared loaf pan and cover, allowing the dough to rise for about 60-90 minutes. While the babka rises, preheat the oven to 350 degrees F and then bake the babka for 45-50 minutes. Once removed from the oven, allow to cool completely before serving. ** If the yeast does not bubble or foam, the yeast might be dead. Make sure the milk wasn't too hot, or try another packet of yeast. *** If you're pressed for time, you can refrigerate the dough for a minimum of 4 hours. And if you're into a sourdough like taste you can leave the dough in the fridge for another day and then bake with it as directed. I did this out of pure laziness one time and it's kind of my go-to preparation now. - note that this recipe makes two loaves. If you don't want two loaves of babka you can reduce each aspect of the recipe by half, or store one of the formed cakes in the freezer for up to 3 months before baking. - This recipe is adapted from my Toasted Almond Babka recipe.